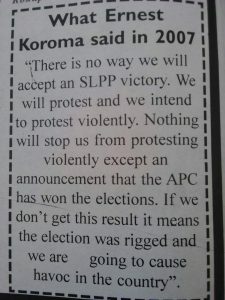 The Presidential Candidate of the Sierra Leone People’s Party, Rtd. 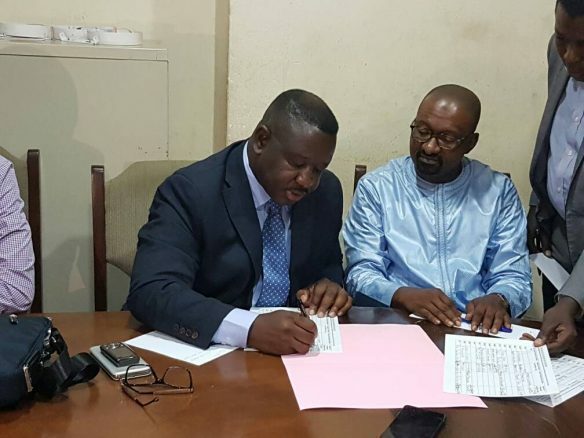 Brigadier Julius Maada Bio has assured the Political Parties Registration Commission that no single blood will drop as a result of these elections. Bio gave PPRC this assurance on Tuesday, 16th January 2018 as he signed the Codes of Conduct committing himself and supporters of the SLPP to peaceful elections at the PPRC Conference Room, Tower Hill, Freetown. In signing the Codes of Conduct, Rtd. 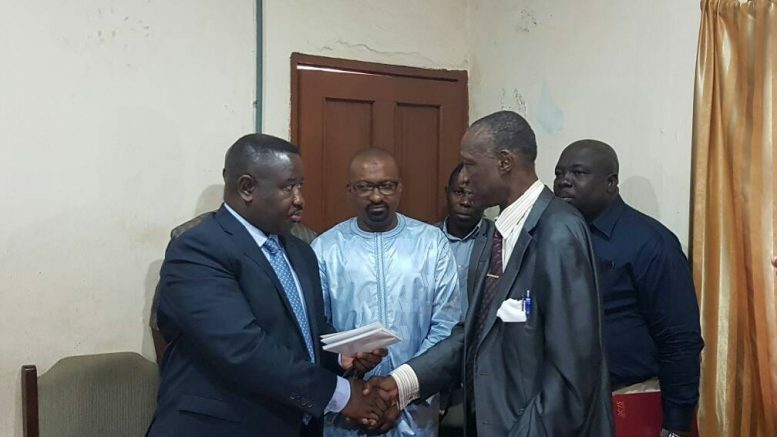 Brigadier Julius Maada Bio promised to cascade details of the Codes of Conduct to the SLPP membership and encouraged the commission to prevail on other political parties to do the same. Bio also said that he prayed that polling day would be like any typical day devoid of tension, anger, and violence so that people can vote peacefully and later look forward to the genuine results. Bio urged the Commission to continue its excellent work in regulating political parties for a better Sierra Leone. The Chairman of the Commission, Justice Hamilton lauded Rtd. Brigadier Julius Maada Bio for his pivotal role in initiating the peace process in the past and pleaded with him to maintain his stance on ensuring peaceful democratic elections. Copies of the Codes of Conduct were handed over to both Rtd. Brigadier Julius Maada Bio and his running mate, Dr. Juldeh Jalloh. The Codes of Conduct were put together through the participation of political parties representatives, APPWA and APPYA to ensure the conduct of peaceful elections. Accompanying Retired Brigadier Julius Maada Bio was his Running Mate, Dr. Juldeh Jalloh, Hon. Rado Yokie, Lawrence Lahai Leema, National Publicity Secretary and, Senior Party Stakeholder, Kabineh Kallon. 1 Comment on "Peaceful Maada Bio Envisages Peaceful Elections in Sierra Leone"
Julius Maada Bio has always been a peaceful man. From our formative years, he was always peaceful among his peers; which is what influenced his joining the military, to ensure the people of Sierra Leone enjoy peace at all times. Even when that peace was interrupted by the rebels; he never wavered in his commitment to the people of Sierra Leone. And while that commitment was tested by the rebels, Bio and his colleagues stood in defense of their country. We lost some of our peers to the war. May they rest in Perfect Peace. Every day that Bio promotes peace, he is honoring the lives lost in defense of Sierra Leone; his military comrades and those civilians who lost their lives to the war. Julius Maada Bio is not on this journey to return Sierra Leone to true democracy alone. He is on this journey with the spirits of his comrades, those with whom he was in arms to defend the motherland, Sierra Leone, the land that we love and cherish. Maada, we are with you on this journey. Victory for the people of Sierra Leone is sure at hand. We admire your resilience and continued sacrifice for Sierra Leone. Good luck and may God grant you victory.